The hippocampus is a part of the brain that shrinks as we age, causing memory disorders. An acceleration of this phenomenon is one of the signs of Alzheimer’s disease. 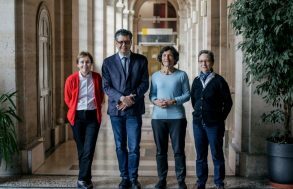 Joint international work involving French (1) research teams has shown that genetic mutations are linked to the reduction of the hippocampal volume. These results were obtained from epidemiological studies that analyzed the genomes and MRI scan images of 9232 participants aged from 56 to 84. In France, roughly 2000 MRI scans were performed as part of the study known as the “3-city-study” (2). The results of this work will be published on April 15th 2012 in the review Nature Genetics. Shrinkage of the hippocampus occurs with age and is caused by the cumulative effect of various factors. Hippocampal atrophy is a recognized biological marker of Alzheimer’s disease, so it is vital that researchers determine the cause of this process. An international study under the French leadership of Christophe Tzourio looked for genetic variabilities linked to the shrinkage of the hippocampus. To do this, the genomes and MRI scan data of over 9000 persons aged between 56 and 84 were analyzed with a view to detecting a potential link between certain mutations and the reduction in the hippocampal volume. The participants’ data (both subjects presenting dementia and healthy subjects) were extracted from eight cohort studies in Europe and in North America. The researchers first identified 46 differences in the DNA sequences of the participants, thought to be related to a reduction in the volume of the hippocampus. Eighteen mutations located in different areas of chromosome 12 were found to be strongly linked to shrinkage of the hippocampus. The other links included a mutation on chromosome 2. Then a final mutation on chromosome 9 was also found to be involved in the hippocampal shrinkage in a third and younger sample. These results indicate that “as yet unidentified factors” trigger mutations in precise areas of the genome, causing the reduction of the hippocampal volume. The hippocampus (shown in red) is a structure located deep down in the brain, that plays an essential role in the memory processes. Its volume decreases with age and this shrinkage occurs more rapidly in cases of Alzheimer’s disease. For this study, computerized analysis of the MRI scan images and calculation of the hippocampal volume had to be developed individually for each participant. Once the mutations had been identified, the researchers tried to find out what exactly they modified. They discovered that they changed the structure of genes that were important for numerous functions involved, among others, in cell death (HRK), embryonic development (WIF1), diabetes (DPP), or neuronal migration (ASTN2). “This study marks a major turning point, since it confirms the fact that genetic factors are linked to a brain structure, the hippocampus, involved in dementia and more generally in the aging of the brain,” explains Christophe Tzourio. This new approach, that studies a targeted area of the brain rather than a disease, will help us to more precisely decipher the mechanisms of Alzheimer’s disease. The next stages will aim at obtaining a better understanding of how these genetic mutations are actually involved in the overall functioning of Alzheimer’s disease. Although clinical applications are not for the imminent future, these discoveries are a step forward to a better understanding of this disease and of cerebral aging in general. “This discovery confirms the importance of using sophisticated means such as MRI scanning and genome analysis for the cohort studies. And this is only possible if we have close collaboration between the different disciplines involved,” concludes Christophe Tzourio. (1) In neuroepidemiology (Inserm U708 – University of Bordeaux, C Tzourio), brain scanning by the neurofunctional imaging group (CNRS/CEA/University of Bordeaux Segalen, B Mazoyer), and in genetics (UMR 744 Inserm University of Lille, P Amouyel). These results are confirmed in a second article “Identification of common variants associated with human hippocampal and intracranial volumes“ published by another major research consortium and to appear in the same issue of the review Nature.